Your smile brings out the beauty in you, but at times, an accident, ill health or any other incident can wreck that beauty in you. Loss of teeth can be a nightmare for many and sometimes, it becomes reality. You are not able to grow new teeth in place of lost ones, but you can certainly get artificial replacements. These are called dental implants. Dental implant is a revolutionary idea that has changed the face of dentistry over the past two decades. If you are not able to laugh or smile as freely as you once did because you lost your teeth/tooth, we can help. Greencastle Dentistry is one of the leading centers for all kinds of dental services, including dental implants. Dr. Khantsis is a specialist in dental implantology. He is highly qualified and have years of experience in the field. Whether you need to replace a damaged tooth or a set of teeth, Dr. Khantsis will help you to get your smile back. You can rely on him to do the job. Click to watch video testimonials from real patients. Many people who wear dentures know how uncomfortable ill-fitting dentures can be. Compared to traditional dentures, implant supported dentures are a better option for several reasons. First, they are fixed, which means you won't have to worry about your dentures slipping out when you eat your favorite food or laugh heartily. Second, because you can chew your food better with implant supported dentures, your overall health improves. Third, they help to prevent bone loss. Fourth, they are realy affordable in our office. That is right! Dental implants cost you a lot less in our office that anywhere else. Call us today for more information about dental implants. We will be happy to answer any questions you may have. Ill-fitting dentures can slip within the mouth causing you to mumble or slur your words. Dental implants will make it possible for you to speak without the worry that your teeth might slip. Dental implants don't require reducing other teeth, as tooth-supported dental bridges do. Because nearby teeth are not altered to support the implant, more of your own teeth are left intact, improving your long-term oral health. 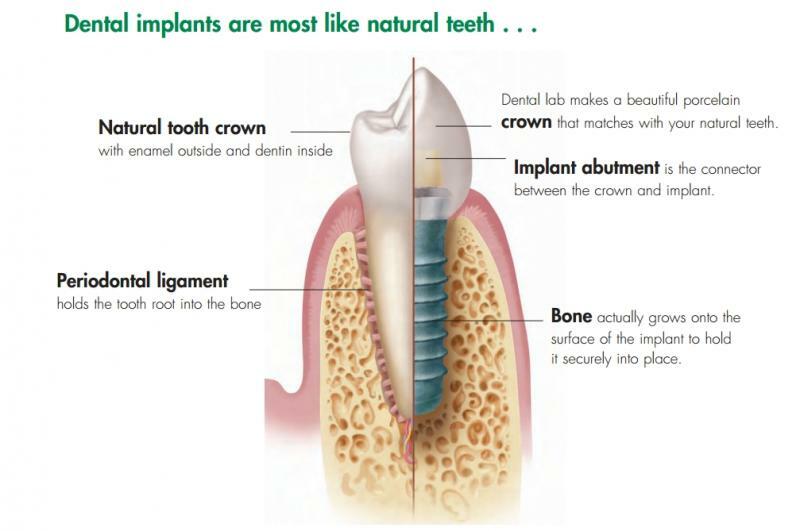 Individual implants also allow easier access between teeth, improving your oral hygiene. Dental implants are very durable and will last many years. With good care, dental implants will last a lifetime. Removable dentures are just that: removable. Dental implants eliminate the embarrassing inconvenience of removing your dentures, as well as the need for messy adhesives to keep your dentures in place.